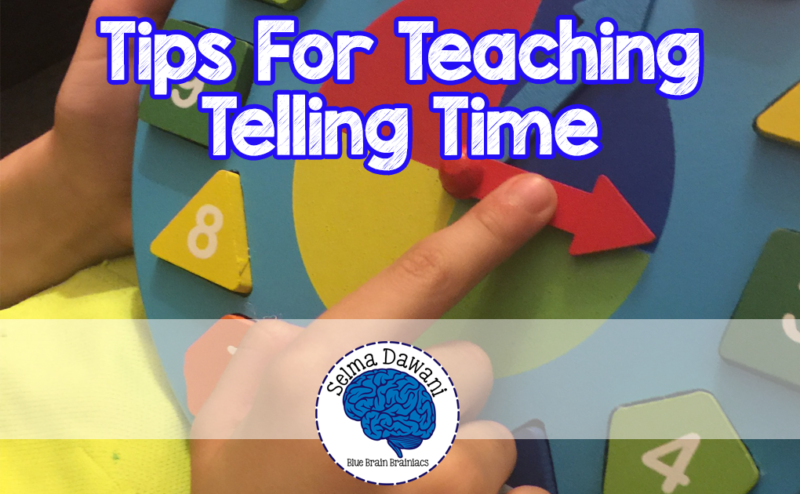 Telling time is one of those life skills that we all need to learn. The world is becoming increasingly digital each day but it is still an important skill to be able to read an analog “old fashioned” clock. Analog clocks also allow students to see what time feels like, they can visually see how many minutes five minutes is. It really is a great way for them to feel a sense of time and its cyclical nature that digital clocks can’t do. Before even teaching time, make sure your students have had a chance to observe their schedule. Make sure to have a visual schedule with the time on it and refer to it throughout the day saying that you have X minutes left to complete an activity, X hours till the next special, etc. Students need to understand the importance of time and knowing it before even starting to teach it. Students should also know how to count by 5’s. What breed of dog can tell time? A watchdog. Why did the silly man throw his clock out the window? He wanted to see time fly. Why did the girl sit on the clock? To be on time. What would happen if we didn’t have clocks? How would we know when to get up and go to sleep? How do we use clocks to tell time? Say the short, which is the hour, and then the long, which is the minute. After introducing the poem, I will give the students the hour and minute hands and instruct them to write their name on it. They should write their first name on the hour and their last name on the minute. Explain that this is also a trick they can use to help them remember which to say first. Download clock hands and poem here. Next, I will give them a paper plate and they will follow the instructions. Fold in half and open back up. Write 12 at the top and 6 at the bottom. Have them use the inner circle of the paper plate to label the hours. Make sure to explain the importance of the placement of these numbers. Talk about how you have literally halved the clock. We have 60 minutes on the entire face so when it is 59 minutes, the minute hand will be on 00 and that is o’clock. This is also the time to talk about when the minute hand is on 30, it is half way through the clock so we say half past the hour. Next, the student will fold the clock horizontally. This way you have the clock divided in quarters. Have them label it 3 and 9. If someone says it is a quarter past the hour, you will know they mean the quarter here…. If they say it is a quarter to the hour, they will mean, here. Now, let’s fill in the rest of the hours. Remember when you are writing the hours in to leave equal space. Now that we have the hours on the clock, to make learning the minutes easier, let’s write them in. We have 60 minutes on the entire face of the clock. “Let’s count by 5’s and see if that is how we need to divide them up.” Start with 0 and touch12, then have students touch each hour hand and count by 5 still they hit 55, then stop them and count 56, 57, 58, 59, 00. Then fill those minutes in. Practice telling time to the hour. Practice telling time to the half hour. Practice telling time quarter past. Practice telling time quarter to. Practice telling time 5 minute increments. Practice telling time with any old minute. Explain how it is usually easier to tell the hour time, until you hit the danger zone. Take your paper plate and color in the quarter to area red. When the minute hand is in the danger zone, the hour hand will come close to the new or next hour, be careful here! Sometimes kids have missed these lessons and find themselves in high school and they don’t know how to read an analogue. A quick and dirty tip to help these students without letting anyone know is by referring to the clock several times during lessons. By pointing out the time right now and then saying what they will do till the expected time. Such as, “OK, it is 9:47 right now, we will continue writing till 10:05.” When it gets close to 10:05 you can say, ok the minute hand is almost on the 1 so we need to start wrapping it up.” If you do this enough, it will really help those students who need it, without explicitly teaching how to tell time. Have students add the time to their homework when they hand it in. At the beginning of the day, give students an index card with a time on it. They will be watching the clock for their time and when the time comes they can bring it to you to get a sticker or stamp.